Before you turn immediately to Amazon, or your favorite online shopping source, think briefly about your gift giving goals and prepare to make some considered decisions! Quick review…. Big6 #1 - Task Definition - Select a suitable and pleasing gift for friends and family, on time and within budget. Big6 #2 - Information Seeking Strategies - Do you need gift advice? See online wish lists? Email a relative for ideas? Gather gift idea suggestions? Check what’s hot this year? Consult online sale flyers? Big6 #3 - Location and Access - Do you know where to find the gift? Narrow the possible online locations, check who has the item in stock? Compare pricing? Big6 #4 - Use of Information - Read online reviews, check prices, colors, sizes, determine if items are available or on back order? Big6 #5 - Synthesis - Add items to your online shopping cart! Select quantities, colors, and sizes if necessary. Be prepared with your plastic cards and specific shipping address information for online shopping. Select delivery timelines to meet your goals. Big6 #6 - Evaluation - Whew! You did it! Now you have time to get those other things done before the unwrapping big day! Here is a copy of the full timetable. Marking of the Gr 12 CAT examinations is taking place around the country. I am part of a group marking the Theory paper. What a wonderful experience it has been so far! So much bonding and learning about the subject and answering examination questions. I am sure that everyone is going to go home at the end of the period having benefited from the experience. 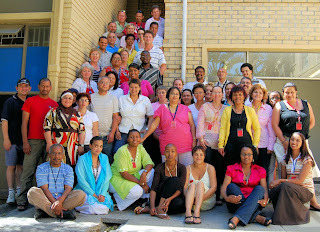 Here is a picture of the group of teachers in the Western Cape who marked the Theory Gr 12 paper in 2008. In general one grade did little work, did not complete their class work, left their textbooks at home, did not complete nor hand in their PATs, spoke during my teaching - you guess which class. In general one class did a great deal of work at home, brought their textbook to class, handed in their PATs and listened in class - you guess which class. The learner's individual results accurately reflect what the examination was meant to assess. Hopefully the weak grade will take note of their results and take corrective actions. I am looking forward to getting the 2009 PATs and planning my work for next year making sure all my learners work and the low marks are not repeated. Enjoy the holidays when they start. 4.8 The question asks for Function but very few learners gave the function of the different kinds of memory. 7.1.a) The question asks the learners to fit the table on a single page. In this question it became apparent that many learners do not know the terms – change the orientation to 'Landscape’, and ‘narrow’ or ‘widen’ the columns. 7.4.b) The question asks for ‘other factors that could be considered to ensure that the secretary’s health is not compromised.’ Now it asks for ‘factors’. It does not ask how to prevent problems. Learners need to pay close attention to the phrasing in the questions. 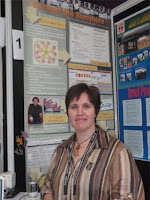 Congratulations to Sarietjie Musgrave of Eunice High School: Free State for her project Spread the Sunshine which gained her runner up position in the Microsoft Worldwide Innovative Teachers Awards 2008, category Innovation in Community Category. It was awarded in Hong Kong early this month. The project for Grade 10 Computer Applications Technology involved learners investigating the needs of disabled people and then using their skills to create useful ICT based artefacts for disabled people. A range of applications were used including an animation package to design a public awareness campaign and Clicker to design software to support the disabled. Thamsanqa Makhathini of Mpophomeni High School: KwaZulu-Natal also went to the ceremony with his project Local is Lekker@Mpophomeni in the Innovation in Challenging Contexts category. Below is his description of his entry. Groups of Grade 11 Computer Applications Technology learners designed research instruments and interviewed community members about pre- and post-1994. Findings, photographs and audio-clips (recorded using cell phones) were then used to create a website. I think the paper was: “doable”, Balanced, Different to the norm – this is a good aspect. I also think it is a good thing that they have been exposed to a paper set by someone else and not by me. Every teacher has their own unique way of setting a paper and pupils get used to that way. They are then only exposed to a different way of setting in the matric exam and can then flounder. It was in my opinion maybe about 30 minutes too long depending on the child. I am not worried about my pupils who have not been working during the year not finishing – they need a wake up call and would have still not finished even with extra time. But my top pupils should be able to finish and they battled hence my decision to give them an extra 20 minutes. As this is an internal exam, I think we as experienced educators should be able to use our discretion about increasing the time given during an internal exam. I have not marked any of my weaker pupils’ papers yet so I cannot comment on their results as yet. Maybe they are going to have been more affected by the length. In my opinion, there was nothing “unseen” or extremely difficult and it was not unreasonable. The database form was more complicated than I had done in class with my pupils but my top pupils managed it well. It is something I will have to work on next year as I seem to never do enough work on forms. My pupils also seem to generally battle with Access in grade11 but with more exposure in grade 12 improve. There was also quite a lot of reading which they have to get used to as it seems that this is the trend with most subjects in the new syllabus and a weakness of our “modern” pupils. In my opinion it was a matric standard paper that grade 11’s had to write and they have not yet had as much exam practice as a matric child has had. My matric pupils found both the prelim practical exam and the final practical exam long, but my top pupils finished comfortably. My top child has got a steady 91% per term this year. For her June prac she got 94% and for this exam 85%. When I asked her afterwards how she found the exam, she said she could do everything but she felt very rushed for time and hence made silly mistakes. When I marked her paper, I realised that she was correct as she made mistakes on sections she knows well and would not normally make mistakes on. She has never been rushed for time before as she always works quickly and efficiently and knows the applications very well. She did not have time to go back and check her work either. My top 2 kids had just finished question 6 when they had 5 minutes left. I therefore gave them an extra 20 minutes. Once I have marked them all, I am going to look at their year marks and if I feel they are too low, I may moderate the prac slightly. However, an end of year exam mark is normally lower than during the year as it is set on a much larger section of work. When all the years’ tasks and PAT are added together, I am sure it will even out. I also don’t want to have my pupils arriving in matric with inflated grade 11 marks but at the same time would not want them to be demoralised. The paper marks well (I have only marked 2) – the marking grid is great. I think that we should have the solutions printed out to see what certain documents should look like: for example the table in question 5. 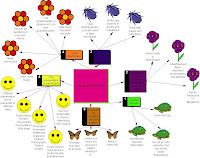 Just check the ticks as in one or two questions the number of ticks does not match the overall mark. Question 6, the type of question I normally dislike marking as it usually takes so long, marks beautifully thanks to the way the memo is designed. I also think for the second year of grade 11’s and a new syllabus, Study Opportunities has done very well to set a paper of such a good standard. I for one am very grateful not to have had to set CAT papers for my school but could rather spend my time on marking the PATs. Everyone knows how long it takes to set an exam paper. CAT should not be seen as an “easy” option for the pupils and it should challenge the bright pupils who choose to take CAT rather than IT or other subjects. It is such a pity CAT is not yet recognized as a subject for university entrance as it is such a useful subject to study. There have been repeated requests to get the password for the exam papers. There is only one way to get them. You must have completed the document found on the studyopportunities.co.za web site and faxed it back to the correct place. The password would then have been SMSed to you. It is also pointless putting a request in a 'Comment' if you do not add contact details, and the password cannot be put onto the blog as that defeat the point of having a password. Gr 11: 150 marks, 3 hours. Experience has however shown that many learners do not need the full time. Slegs AFRIKAANSE vraestel - Vraag 4, eerste bullet moet wees (R0-00 vir lede en R20-00 vir nie-lede). Please open and fix the data files 6Answers.doc (English) and 6Antwoorde.doc. It should refer to Question 6, not Question 7. The Grade 11 Practical examination paper in English with its data, and Afrikaans with its data files is now available. 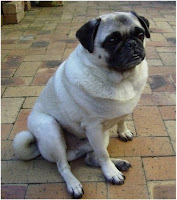 Did you do the Pug Dog Club set in 2006 question paper (data files and memo) as revision with your Gr 10 learners? Did you see the fat fawn pug who had to be taken for a walk, and was also used in other questions in the paper. Well, he is fat and this morning became even fatter.I could scream at him! Long story. I managed to get some special green mealies from Gauteng. I made some special green mealie cake (not carrot cake, green mealie cake). I had it wrapped in heavy Alcan foil in a Checkers packet along with chips, peanuts, dips, biscuits, cooldrinks, etc. especially for our weekend in the Cedarberg. All the bags were on the floor in the garage ready for leaving straight after school today. This morning, I was busy dressing and organising the house. Friend went outside to open the garage door and get my car ready, not thinking of the contents of the carrier bags and the dogs. When it was time to lock the front door we looked for the dogs, and found the fawn pug with his nose in the bag and 3/4s of the cake gone! Thank goodness it was not the fruitcake which was still on the shelf in the kitchen. Now when you do that old exam paper, you know why he is fat! I have just finished marking the Gr 10 PATs. I believe we have left out an important point, or we did not leave it out but we did not allocate enough marks and the learners ignored it. The learners did not properly draw the research project to a clear conclusion: do the public (not disabled people) have a clear idea of the abilities of the disabled and all the different kinds of disabled people, and are there facilities to help the disabled. I think we must allocate more marks to this section and perhaps give more criteria in the checklist. We gave 1 and 4 marks respectively to this and my learners seemed to ignore it, maybe because the rubric did not specify more criteria. Most learners did not answer the main question or problem. The Gr 10 Study Opportunities Practical examination papers are now available in English and Afrikaans. The data files are available - English and Afrikaans. The password will probably be sent on Thursday or Friday. It may be a good idea to relook at the details on 15 June. draw the work to a clear conclusion. Otherwise the handout was well done. Here are examples of my Gr 11 PAT Phases 1 and 2 - Krause and Peterson. We have struggled with this as the learners had difficulty reading the instructions and planning the way ahead. That is the focus of 1 and 2 and they must just learn to focus! Have a look and see where they lost their marks. Phase 6 - it really is a sales pitch about how wonderful the Office suite is to solve a specific problem. You show, demonstrate and convince the Board of Governors of all the wonderful features of Excel, Access and Word which help solve the problem. The Memo for the Gr 12 Written paper - English and Afrikaans. I have just marked Phases 1 and 2 of the Grade 11 PAT. The first challenge, and this part of the PAT is deciding on what is required! My learners had difficulty clarifying what was required. The table, indicating what questions need to be asked was not complete! They did not add the survey, database or general questions. They also did not indicate the category of each question. The survey was well done, with a first section and then questions on specific types of social networking applications. I am going to show mine this PowerPoint and make them redo the whole of Phase 1 and 2. Grade 12 September written paper Afrikaans and English. Week with service providers, power and computer problems. Friday – No Gmail or Google access from home computer. Links on blog not working – service provider hosting blog has had a hard drive crash so data not available. Saturday morning - Phoned my Internet service provider, overseas connection down. Went to Internet café to check Gmail. Links on blog not working. Saturday evening – Storm in Cape Town, power down, sat at laptop with candles marking Grade 12 practical papers until laptop’s power was used up. Links on blog still not working. Sunday – Power up. Overseas connection up so Gmail and Google working. At 11 power went down, trees on line, until 5. Monday – Go to work. Internet at school not working. Links on blog still not working. Tuesday – Internet at school not working. Links on blog still not working. Wednesday – Internet at school working. Service provider hosting blog says I can upload all the work again. School’s service provider – I do not know what their problem was but believe it was first their problem then a Telkom problem. Eskom – Two power interruptions in 48 hours. One reason unknown to me. Second untrimmed tress falling on line. Will upload to site hosting blog links over weekend and use up all my CAP. Encourage more people to use Gmail which can be accessed via a cell phone even though overseas connections may be down. Will laugh at things I cannot change. Server where links are stored is down. My school internet is down. Disaster all round. Thank goodness 4 cellphones. This weekend I have just been forced to use an Internet cafe although I have ADSL at home. My service provider, Internet Solutions, has problems with its international bandwidth. My Gmail and the Blog are hosted by Google, which is international so no access - so annoying. I have also just bought an extra Gig of bandwidth to use this weekend and no access! Ugh! Please check the following amendments to CAT Practical marksheet. 6.7-"Sculpture" in the criterion for the query should be "Sculpting"
6.4-Input mask for CellNo could also be \0000000000 This forces the first number to be a '0'. Errata on the Gr 12 Practical English paper. SORRY. Read the previous post on downloading and installing. The practical exam will be written on 29 August. Right-click on the file name and SAVE it on your hard drive. Then, in Explorer, right-click on the Zip file name and Extract all. The data files will extract to the folder DATA Arts Festival (for English) or to the folder DATA Kunstefees (for Afrikaans). 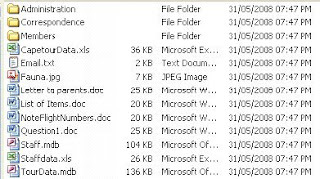 Check that you can open these data files (WITHOUT ENTERING THE PASSWORD FIRST) on the computers that your learners will do their prac exam on. Make sure that you make the correct folder with data available to the learners. 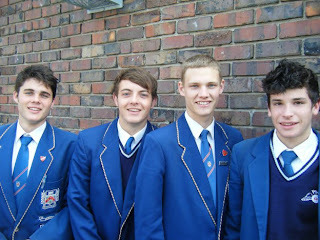 Here are some examples of my learners Phase 5 - Meiring and Woollgar. They did not get full marks! They should have if they had followed the rubric. This project lost one mark - Galer. The rubric lacks something or else I missed something. I told my learners to name all files, queries, reports, etc. in a way that they answer a question or solve a problem. The rubric in future should require a word document listing the questions to be solved and where they are solved / answered so that we can mark in a meanngful way. I would like to collect lessons on AIDS which fall into the skills taught in CAT and make a repository of them. I recently made a call for such AIDS lessons. Congratulations to the CAT teacher, Fieroza, at Durbanville High who responded! The Gr 11 PAT is now available - so nice! My learners have just begun with Access. We started off using the video on What is a database which helped. Have a look at the quiz which has a new section on queries, which my learners have found very useful. These PPTs may help you help Phase 5 of the Grade 12 PAT. Thanks to Peter Davidson. The Hoaxes activity on page 292 has caused such interest in my Grade 10 class! Nice activity. I wonder how other teachers found it. CAT is one of the most important subjects for academic and economic success when a learner leaves school. We must give as many learners as possible the opportunity to study the subject. IF the classes are over subscribed I recommend a skills test, based on and dependent on the opportunities the learners have had for skill development at your school in grades 8 and 9. I normally give my learners a ‘test’ of creating a PPT based on rather simple instructions. If they cannot read the instructions or cannot create / save the file on the network, then they do not get in. Long beforehand they are told they have to create a PPT. I assume that they can ask someone how to make a PPT if they have not made one in grade 8 and 9 classes. I selected a PPT as it is so simple to use. I expect them to be able to save on the network, especially if they have been at the school for 2 years – if they were interested in computers they should have gravitated to the computer lab and saved on the network. Maybe in the future CAT will have restrictions based on language and maths ability, but I hope not. I also give them a lecture about attending school on a regular basis when they do their subject choice. They also see me which may influence their subject choice. And if they did not bother to come for the PPT test, they did not even get onto the selection list. Right-click and use Save As to save the zip files. The password will be provided via SMS as arranged. Memorandum / marksheets as well as Theory Paper will be uploaded after the weekend. Will send SMS's to keep you informed. Many people have just realized that I made an offer of my Grade 10 June exam papers. To test that email to all the prospective recipients of the paper would work, I sent out my Grade 11 paper. I have managed to get all lists in order and am ready to send out when the Gr 10 papers are ready. No more people will be added to the list. Sorry. The current list stands as it is, now. If you have received an email from me, I have your details and you will receive the paper. I am now frantically marking and do not have any more time to administer and organise the sending out of my Gr 10 and 11 papers to new people. The Gr 10 papers will be available next week. The schools who managed to contact me in time were lucky, the papers were free and had the problems ironed out. I will give out details of how many school used the papers after they have been written. Remember security is your problem! My learners have enjoyed doing the papers. You want to know what the paper will look like? You want to know the breakdown of the Practical and the Written paper? Have a look - the breakdown is here. Now you can tell your learners what to expect. Insert page number fields in the format of ‘Page X of Y’ in the footer so that the page numbering starts to appear on the second page. To do this make sure you have a document longer than 1 page. In Microsoft products there are normally a number of ways of doing this. Here are 2 possibilities. Method 1 - Select anywhere on page 1, then go to Insert, Page Numbers, deselect Show number of first page. Then scroll to any page, not the first page, of the document. Click anywhere on the page. Go to View, Header and Footer, go the area where you want the page number (Header or Footer). Click on the Insert AutoText drop down button, and select Page X of Y. Remove the other page number. There you have it. Method 2 - Go to File, Page Setup, then Layout. Select Different first page. Then scroll to any page, not the first page, of the document. Click anywhere on the page. Go to View, Header and Footer, go the area where you want the page number (Header or Footer). Click on the Insert AutoText drop down button, and select Page X of Y. The important thing is to do it from the second page. This can be done in Activity 5, Page 184 of CAT 1. My Grade 10 learners have been learning about their own country in Activity 6 on page 200. Many did not know all the provinces in South Africa or their capital cities! My learners have been doing the chapter Working with paragraphs which includes tabs, columns and various paragraph features. They are completing the Computer Club Newsletter, Test-a-choc, Kliphuisie Holiday Resort and e-Game. They are doing so well! How did we manage to do so well? They have methodically worked through Theme 2. I methodically spend my lessons walking the classroom giving advice where necessary. The learners work at their own speed on their own through the textbook, completing work each week. And the textbook has progressive activities which teach well. Success in challenging aspects of Word! Learners feel successful. The map of South Africa needed on page 200 Activity 6, when opened in Paint, only shows the colours of black and shades of grey. In order to get colours save the image 16 ColorBitmap and you have the option of giving the provinces colour. I have to set a 3 hour practical paper for CAT for grade 11. My school has made the timetable and will not change the days. I have to have 2 back to back sessions because I have so many learners. I planned to have a 3 hour paper but your organisation is causing problems. Based on some reports, some days in the month of May have been designated as power outage days where we have no power between 12 and 2.30. My Grade 11 practical examination will be on one of those days. This means that 2 sessions have to written before 12 noon. We cannot split the sessions as the learners may not communicate with each other. I can manage to write on that day only if the paper is cut to 2 hours, and we start my paper 30 minutes before school officially starts. But now I have heard that power outage days are going to come to a stop. I have set the paper but the paper and the organisation to write it, may have to change, as you change your mind. These are problems I do not need. Clarity is needed. In the Practical work for CAT in Gr 10 the LPG (page 28) indicates that the learner should have knowledge of input devices such as scanner and digital camera. Well, we have just had a scanner installed and I will soon create lessons which will compel each learner to use a scanner. With regard to the digital camera it was easier but not without problems. Each learner had to get photographs of themselves using technology. The pictures were all collected in a folder on the network and named accordingly. I organized a lesson where they will have to use pictures of themselves. Those learners who did not bring a photograph of themselves will have to select the EmptyCan or HotAirJustPromises files. 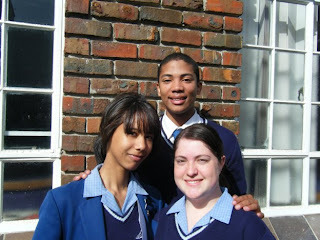 Learners took photographs using digital cameras and cell phones. They then transferred the pictures to the computer. One learner Bluetoothed his picture to my cell phone! I have also learned how to transfer files from my cell phone to my laptop! In the Gr 11 Theoretical aspects the learners have to have operational knowledge of mobile technologies – I am learning how to use my cell phone and will soon create work which requires use of the cell phone. Gr 11 also requires operational of networking – that still awaits investigation. A number of people have indicated they wish to use my Grade 10 June exam papers. The paper will be available on the blog, freely available after July, before that password protected. The work which will be covered are those from Theme 1 and Theme 2 up to middle May - have a look at the links. I hope to have the papers available in Afrikaans. The nice thing is that you can adapt them to your needs! If you want to use the papers THIS term please send me the details below. I will then send you instructions for the preparatory work which needs to be done. You will receive the password later in May. This is the form needed to complete for the June CAT Gr 12 Examination Paper from Study Opportunities. I had a brainwave for Phase 3. The learners have all the information / evidence they have found in their LONG document arranged in a suitable order. Have a table or list of all the questions at the BEGINNING of the document. Submit in digital AND print/hard copy format. I have set a nice Grade 10 theory paper and will make it available on 22 May if anyone wishes to use it. It will also be available in Afrikaans. There may also be other papers - Watch this space! Here is her Phase 1 and the rubric where she obtained 30/35. I marked it as I interpreted the rubrics! Study Opportunities has drawn up Grade 12 question papers (Paper 1 and 2) and memoranda for the June exams. 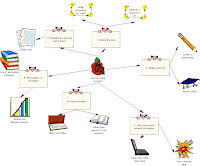 While it is aimed at schools who use the Computers, part of your life series, the Content Framework in the LPG and Sample Papers were studied and compared and taken into account when drawing up the papers. The papers are set, checked and translated by a team of experienced teachers currently teaching the subject. Note that the papers and memorandums will be available in English and Afrikaans but the papers need to be duplicated by the school. The cost will be R125 per paper per school, irrespective of the number of learners. The papers must be written on Wednesday 4 June (Paper 1) and Friday 6 June (Paper 2). Study Opportunities also plan to do the same with the Prelims/Trial Exams. The June Paper will be used as a trial run to sort out potential logistical problems. An entry form and more information will be available from Study Opportunities next week. My Februarie toets is vertaal. Hier is the vraestel en die Appendix Dankie Judy Louw wat al die vertaal werk gedoen het. I have almost finished marking Phase 2 of the PAT. I would say 3/4 of my learners have not shown or indicated how they can use Word, Access or Excel to solve the problem in their PAT. In future I think the rubric needs a special feature, similar to the Internet search feature, on retrieving information from processing data in Word, Access and Excel. Many learners will not be able to get the answers to their questions in the sources/places they listed as they are not aligned. A few of the learners had nice Survey features. In future I think the rubric needs a special feature, similar to the Internet search feature, on retrieving information from a Survey. So much teaching is still required! In the past photographs of my learners were used on the front covers of the CAT textbooks. They were so thrilled and even now they ‘look’ at themselves on the front. Other kids ‘look’ at their friend’s pictures! It was so cool! I am looking forward to seeing what pictures have been sent for the new front covers! Details of how to take them and submit them are on the web site. The date for submission has been extended to 18 April. Look at some of my entries! A grade 10 learner at home, and her brother. The learners need to be taught the difference between an Agenda and Minutes! In the Paired Reading task they cannot seem to get the difference! I do recommned that learners are taught how to prepare an agenda so that they are able to realise that not all templates are correct and that they must evaluate them. The templates and wizards in Word are much too involved and not of the level required. Have a look at my Gr 12 February written test on Hardware, software and networks including trouble shooting with the Appendix. I set the test within a school environment. Many learners lost marks as they did not answer their questions within that environment! Judy Louw kindly translated the tests! Hier is die vraestel and die bylaag! When we teach CAT we have to be so careful with respect to our dress. We teach young men and women with bouncing hormones! I have noticed short skirts and low dress lines (I cannot think of correct words). When we crawl around computer boxes and lean over learners to assist them, we must wear suitable clothes.